The University’s Founder’s scholars and biggest benefactors came together on March 25 for Fordham’s signature annual fundraising event: the 18th annual Fordham Founder’s Dinner. 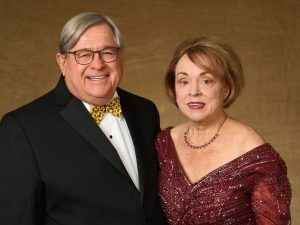 The gala raised nearly $2.6 million for the Founder’s Undergraduate Scholarship Fund—the second highest amount in Founder’s history. More than 1,000 alumni and friends of Fordham attended the black-tie affair at the New York Hilton Midtown—a new venue for the dinner and a hotel that has hosted every U.S. president since John F. Kennedy. The 2019 celebration lauded six longtime supporters of Fordham—Solon P. Patterson and Marianna R. Patterson; Joel I. Picket and Joan Picket; and Dennis G. Ruppel, FCRH ’68 and Patricia Ann Ruppel—and honored 44 Founder’s Scholars, whose Fordham education was largely made possible by the Founder’s Scholarship. Beneath the dimmed lights of the Grand Ballroom, Amie Ko, GABELLI ’19, spoke on behalf of the Founder’s Scholars. “On this night, standing before you, I can’t help but think that in 54 days I will no longer be an undergraduate student at Fordham,” said Ko, an aspiring tax accountant who will intern at PricewaterhouseCoopers this summer. “From the start of the semester, I have been asked countless times: ‘How does that make you feel?’ And to be very honest, I am scared. I am nervous. I am sad,” she said. Ko, a Division I athlete for Fordham’s swimming and diving team who recently led her team to its first undefeated season in almost a decade, spoke about her gratitude for her teammates, her four years of Fordham memories, and the donors who made her current reality possible. She also took a moment to remember one Founder’s scholar who couldn’t make it: Rachel Ragone, GABELLI ’18, who died last January after a long battle with bone cancer. As Ko recounted Ragone’s four years at Fordham—her studies in applied accounting and finance, her semester spent at Fordham’s London Centre, her passion for raising funds and awareness for children’s cancer—a photo collage of Ragone appeared in the background. During the festivities, Father McShane presented the Fordham Founder’s Award to each of the three couples honored this year. The Pattersons, natives of Atlanta, have been married for nearly 60 years. Solon Patterson worked for 48 years in investment management; he retired in 2007 as CEO of the investment firm Montag and Caldwell. Marianna Patterson worked in the banking industry before becoming a full-time mother. The couple has been instrumental in helping Fordham’s Orthodox Christian Studies Center to prosper over the past decade. In the early 2000s, they created an endowment to establish the Patterson Triennial Conference on Orthodox/Catholic Relations. “In the process, they have enabled Fordham to become the only Catholic university in the world that offers degree programs in Eastern Orthodox studies,” said Father McShane. They also established the Father John Meyendorff & Patterson Family Chair of Orthodox Christian Studies, now held by Professor George Demacopoulos. “Solon is Greek Orthodox, and I am Roman Catholic, and we have long prayed for the end of the separation of these oldest and largest Christian bodies. Their reunion would be a positive event for all Christians the world over,” Marianna Patterson said. The Pickets are longtime New York philanthropists. Joel Picket, a Manhattan native, is the chairman and CEO of Gotham Organization—the real estate development firm that was key to constructing several buildings on campus, including the Law School/McKeon Hall complex at Lincoln Center and the William D. Walsh Family Library at Rose Hill. He is a two-term member of the Board of Trustees and a current trustee fellow who helped make the master plan for the Lincoln Center campus redevelopment a reality. Joan Picket, who has worked as an advertising copywriter and real estate broker, has served in multiple service organizations. 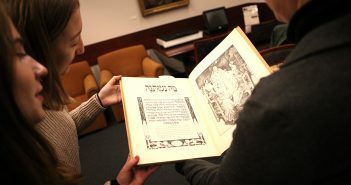 Together, the couple’s generosity spans several initiatives at Fordham, from scholarship support for Jewish studies to the funding of new campus facilities. The last couple includes a Fordham alumnus—Dennis Ruppel. Today, Ruppel is chairman of Freedom Bank, chairman of AmCap Insurance, and co-owner of the Press Hotel in Portland, Maine. He is a current trustee fellow who has served multiple terms on Fordham’s board of trustees. 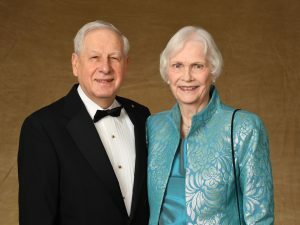 Dennis and his wife, Patricia Ann, champion multiple organizations, particularly those devoted to early childhood education. “In her own words, Pat has ‘adopted Fordham,’ and carries the University in her heart,” said Robert D. Daleo, GABELLI ’72, chair of Fordham’s board of trustees and a Founder’s 2019 co-chair. At Fordham, the couple created the Dennis and Patricia Ruppel Endowed Scholarship. 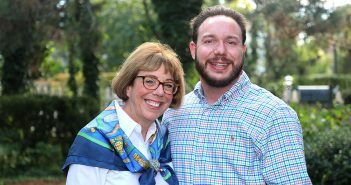 They have also supported athletics, WFUV, career services and experiential education, the sailing program, and other University endeavors. “Fordham had few students from Florida when I arrived in 1964, never having been in New York City. I was the virtual stranger in a strange land,” Dennis Ruppel said. 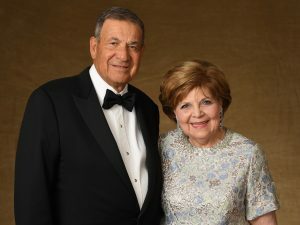 The 2019 awardees join 47 other Founder’s Award recipients, the first of whom were honored in 2002. To make a gift to the Fordham Founder’s Undergraduate Scholarship Fund, please visit fordham.edu/foundersgiving.